In Europe, after World War II a new form of motorsport became popular, called "moto-cross" or "motocross". From 1953 onwards all across Europe cross races were held. The light and easy to adapt single-cylinder-road motorcycles of Husqvarna soon became favorite for off-road use. Rolf Tibblin won with his 250cc Husqvarna the coveted world title in 1959. That was the start of a long and successful career in motocross competitions for both Tibblin and Husqvarna, which in the course of time many World Championships, victories at the "Motocross of Nations" and even a victory at the Baja 1000 were achieved. 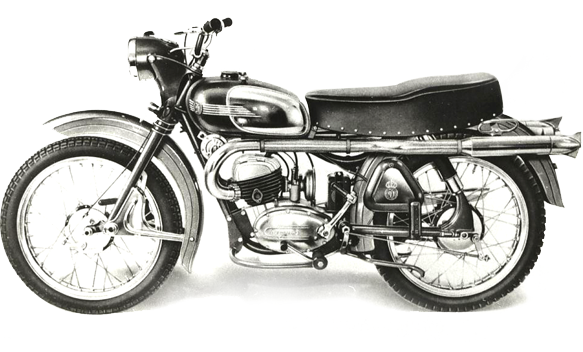 In 1960, Bill Nilsson won the first world title in the 500cc class for Husqvarna. Husqvarna benefited from the experience gained from the victory of Tibblin with his 250cc machine in 1959. A highly successful top machine was built for Nilsson, which formed the basis for the dominance of Husqvarna in the heaviest motocross classes. In the 70’s two-stroke engines became more popular due to their much lower weight and much better handling characteristics. In the first instance, the comfort and driveablility were determined by the improved front fork with damping and double rear shock absorbers (i.e. twinshock), by the mid '80s, the twinshock absorbers were replaced with monoshock systems with or without link. The bikes used for classic motocross are therefore often the twinshock models and the 1984 model of Husqvarna was very good and performed excellent. This was the ideal model for the twinshock class.